Click, kill, loot, level up. Click, kill, loot, level up. Loot, sell, re-equip. Rinse, repeat. Your weapons get more powerful as your enemies get more difficult, and the goalposts move, and move, and move. Click, kill, loot, level up. It's enough to make you wonder why we play video games in the first place. Torchlight II, with its simple gameplay and tightly controlled loop of challenge and reward, is certainly enough to make one start questioning oneself: It's been twelve hours. Is this just a treadmill? Why am I spending time on this at all? But each time I wondered that, I'd step back and realize how much fun I was having. And then I'd remember: I play video games because they're awesome. As of this writing, my time with Torchlight II clocks in at just a hair under 30 hours—that includes the meaty three-act story, a ton of side quests, and a few hours of running around with alt-characters. As I started New Game+, I had killed 11,256 monsters (1638 of which exploded in gouts of blood), taken down 177 sub-bosses, looted 338 chests, caught 34 fish, gathered 231,070 gold and taken 67,272 steps. The game does not keep track of mouse-clicks, but I'm sure that if it did, I would be way past the hundred thousand mark. Torchlight II is, on its surface, a very simple game. You control a heroic character on a quest. Using your mouse and some hotkeys on your keyboard, you maneuver him or her through a fantasy world, undertaking missions, gathering loot and gear, and clicking on enemies until they explode. It's no surprise that several staffers at Runic games worked on Diablo and Diablo II—where the original Torchlight felt like an homage to the original Diablo, Torchlight II feels somewhat like a modernized take on Diablo II. At its core, it's not a complicated game—anyone looking for strategy, contemplation, or deep tactical gameplay would be well-served to look elsewhere. 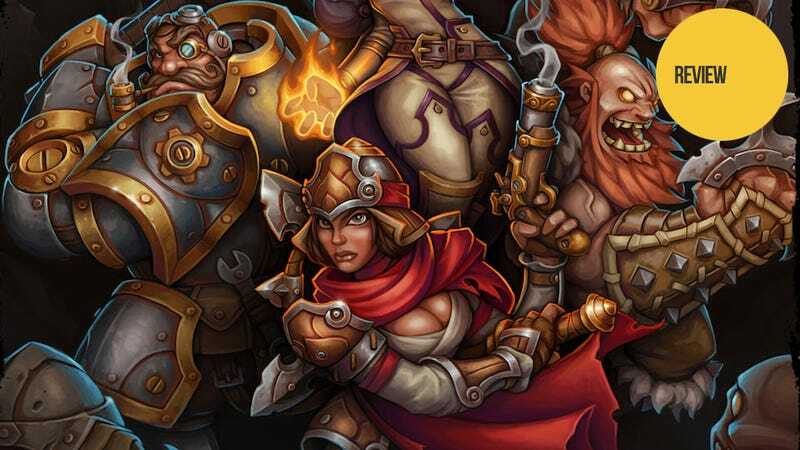 WHY: Torchlight II is a sprawling, ambitious game that does one thing very, very well. It gives you a world you'll want to explore, filled with enemies you'll love to destroy. Type of game: Action-RPG centered around clicking on enemies in randomly generated dungeons while acquiring randomly generated loot and equipment. What I played: Over a period of about 30 hours, completed the story on normal difficulty, mostly solo. Played several different multiplayer scenarios, and tried the game with two of the other character classes. My engineer's devastating seismic-slam/flame-hammer combo feels more satisfying than clicking has any right to. Writing this review and realizing that against all odds, I still want to play more. How difficult it is to play with friends of varying levels. Getting sick of agonizing over loot, wishing that each item showed its suggested price so I could just value them and be done with it. "I say wrench, you say greathammer. Let's call the whole thing off." "I smashed an Urn, and I liked it." So, what compels us to play games like these? In the case of Torchlight II, it's pretty simple—the game looks and sounds splendid, and is a joy to play. Its world is inviting and rich, colors bouncing around the screen in a deadly, candy-colored fireworks show. Ex-Diablo composer Matt Uelmen's soundtrack is the perfect complement to the action, a blend of acoustic guitar arpeggios, industrial-metal dirge and dark fantasy caterwauling that stays out of the way without hiding. The feel of the game is spot-on as well, and it conveys a sense of easy empowerment—by the end of my first time through, my engineer was a walking bomb, capable of dropping seismic rifts with her boots before slamming her weapon into the earth, igniting all within her sizable reach. If you're wondering how Torchlight II stacks up against Blizzard's recently released Diablo III, I've written a whole list of ways that the two games are similar, and different. But to sum it up, I'd say that Torchlight II feels smaller and more personal, while also managing to be more ambitious, in a rambunctious sort of way. It's a game that doesn't care about being perfect—it's much more concerned with showing players a good time. Torchlight II is also a welcomely generous game. It offers a 20-25 hour quest (on normal difficulty), as well as a vast amount of replayability both in New Game+ and in its many multiplayer options, particularly given the four different character classes and myriad available character builds. And on top of that, Torchlight II is fully moddable, meaning that users can freely change everything about the game, from the graphics to the rules to the "level cap" of 100. Time will tell what wonders (or disappointments) this feature will bring, but if I know anything about the PC modding community, it's that they rarely fail to impress the living crap out of me. The story of Torchlight II takes its structural cues straight from Diablo II, in that you spend most of your time tracking down the hero of the first game, who has turned evil. The Alchemist, one of the stars of the first Torchlight, has become corrupted and set off on a killing spree across the land. He's trying to unleash some great evil or another and open a gate to some neatherrelam or another… none of it's that important, because unless you have decided to make it a point to care about Torchlight lore, the story is just a mishmash of fantasy gobbledygook. But while the story of Torchlight II is a forgettable mess, rarely has a game's story had less of an impact on my overall enjoyment of it. In part, that's because the world of Torchlight II is just such a pleasure to be in that I don't much care about the whys and wherefores. The world looks lush and painterly, with rich-hued flora and fauna offsetting the brighter neons of spells and powers. It's a simplified look, almost MMO-like in its broad shapes and low-polygon construction. It's warm and inviting while simultaneously foreboding and exciting. Torchlight II is a fine example understated art direction. One of the first things you do in Torchlight II is choose a pet for your character. This animal will follow you around for the entire game, fighting at your side, carrying your loot, and even making runs to the store to pick up more potions while you're in a dungeon. I almost feel as though this one inclusion says everything you need to know about Torchlight II. Yes, it will give gave you tasks and treasures, a lovely world and a grand quest in which to partake. And it will also give you a cat, or a dog, or a dragon. Enemy design, too, is outstanding. It's a steampunk-fantasy via Brothers Grimm pastiche sort of deal: Giant, robotic metal centurions with huge machine guns (yep, machine guns) patrol one room, but in the next, a loping gravekeeper leads a pack of goblins. Add a touch of H.P. Lovecraft (Tentacle-face alert!) and a hint of the bizarre (Spear-wielding Fungus-men?) and you've got a highly enjoyable bestiary. Enemies are also interesting to fight, attacking in a number of varied patterns that can be strategically countered. It can really pay dividends to learn each enemy's tells, particularly on the higher levels—while it's possible to just potion-chug your way out of most tight spots, the game is much more doable if you watch for the enemy's attack patterns and move out of the way at the right moment. A quick word on cost: Here at Kotaku, we've made a decision to avoid assuming that a certain amount of money is a lot or a little. It's different for everybody. That said, I simply have to mention that Torchlight II, with all its depth and generosity, costs $20. Twenty bucks. That is bananas. If Torchlight II falls down in one notable area, it's that sometimes the loot can get to be a bit much. I write that in full knowledge that there is a subset of people who will read that and think "Yes! Finally, my game!" And okay, those people will love micromanaging the hordes of various weapons, armor, rings, necklaces and power-up gems they'll pick up over the course of the game. And while I like item-management myself, there is a limit to that, and Torchlight II goes beyond my limit at times. I simply don't care to weigh whether the level 37 axe with the 208 damage per second and the +110 poison damage over 30 seconds is better than the level 38 axe with 225 dps, a gem slot, no poison damage and a bonus to weapon speed. I'd love to have been able to quickly tell at-a-glance the exact effect that the weapons would have on my character (or failing that, at least have a sell-price in my inventory so that I can ballpark them), though I acknowledge that in a game with as many various stats as Torchlight II, that's a lot to ask of even the most talented UI developer. As sprawling, generous and occasionally unwieldy as Torchlight II is as a single-player game, it's doubly so as a multiplayer game. Everything in the game can be done in singleplayer or in multiplayer, and it all seems designed with a completely open-ended approach. Want to take your level 40 mage back to help out your level 7 friend? Go ahead! Want to trade some ridiculous unique high-level loot for a low-level shirt? Have fun! Want to solo the game on the same server with your friend, chatting as you fight your way through opposite ends of the map? Go ahead! It's difficult to truly evaluate Torchlight II's multiplayer at this early stage—I can at the very least say it's functional, and a good deal of fun to team up with friends and take down monsters. It can be tricky to match levels with someone, though, and you'll probably want to have characters set aside that you play with together. In the games I've played (all on pre-release code), I've also seen some weird bugs—enemies that stop attacking and stand still, other players' avatars engaging in nonstop attack loops, that sort of thing. That said, simply opening up your own server to anyone of a certain level who wants to drop in has a lot to be said for it. I plan to continue to play Torchlight II multiplayer over the coming weeks, and if anything substantive changes I will update this review. For now, multiplayer feels loaded with potential, particularly as player vs. player gets going and the modding community has some time to get their hands dirty. For a game about crushing demons with a giant hammer, Torchlight II feels lighthearted. It moves with a spring in its step, bouncing you ever closer to that next level up, that next piece of shiny kit. It's a game designed around momentum, and it's stickier than anything I've played in a long time. It gives the player a simple task and focuses on making that task as pleasurable as possible, then does it again, and again, and again. Play any video game for a long enough period of time, and you'll start to wonder why you're playing. Torchlight II, with its laser-like focus and medulla-tickling appeal, is a welcome reminder of why we play. We play to visit other worlds, to unlock incredible new power, to meet mysterious new beasts and destroy them. We play video games because they're awesome. Click, kill, loot, level up. Click, kill, loot, level up. More, please.